Gathering My Roses: JOYA Shoes -- Giveaway! Ends 8/5/11 -- CLOSED! JOYA Shoes -- Giveaway! Ends 8/5/11 -- CLOSED! As I posted earlier, I was blessed to receive two pair of Joya Shoes to review. They are... amazing. The sheer comfort of these shoes is enough to convert me to them forever. I received the Venezia -- a very well crafted athletic shoe -- and the Cairo -- a sandal. The Venezia is the Athletic Show that I reviewed here. To say that I'm impressed with it -- is an understatement! I was, I admit, a bit disconcerted when I saw the sandals. I grew up on a beach and either went barefoot or wore sneakers or dress shoes. I took a dim view of sandals because they NEVER fit me right -- they hurt -- and I just never liked them. However, Joya sent them to me and I had to give them a try. WOW! I am so glad that I did, too! Trust me, these are NOT the typical sandal! The Cairo is constructed with total comfort in mind. You feel like you're walking on a cloud -- just as the designer, Karl Mueller Jr. intended! One of the things that won me over was the Three-Point Strap Adjustments at the heel, across the top of the foot, and the toe-box. Being able to adjust the fit of the sandal at these major points is a sure sign that the designers put the wearer's comfort at the forefront. The sewn-in 3D Mesh insole is fantastic. It wicks away moisture and the small 'beads' have a massaging effect on the soles of your feet. It is simply bliss to walk in these shoes. Another benefit -- the outsole of the shoe is NOT slick! It's ridged and patterned and it GRIPS the pavement. No slipping and sliding, no worrying about falling. Trust me, in Savannah Georgia (land of the cobblestone), this is extremely important! For the first time in my life (and I'm 50), I'm wearing sandals. I am enjoying every single minute of it. ***ATTENTION! *** Every 100th person who joins the Joya Shoes Facebook page... also gets a free pair of their choice! Now, for the best part! The generous folks at Joya have kindly offered one of my readers a chance to win a pair of their shoes! Isn't that fantastic? MANDATORY ENTRY: Read my Joya Shoe review and tell me two things you learned about the shoes / company! 1. "LIKE" (Fan) Joya Shoes on Facebook. 3. Tell me which Joya Shoe you'd like to win! 4. Sign up for the Joya Shoe Newsletter on their main page. 10. Post about this contest on your blog and link back here! 11. Enter another contest on my blog and then come back and tell me which one. 12. Grab my button and post it to your sidebar or favourites page! Vote us UP on PRIZEY for a BONUS ENTRY! This contest will be open from Thursday, July 14th until Friday, August 5th. Winner will be announced on Saturday, August 6th. Disclosure: I was provided with two pair of Joya Shoes for the purpose of this review and giveaway. I received no other compensation. My opinion is based solely on my own experience and use of the items reviewed. These have to be some really wonderful shoes! With the sole construction and the 3-way adjustment feature I can only imagine how comfortable these would be. Living in Florida the Cairo would be my choice. No doubt with the back and feet issues I have I would think I was walking on clouds. They truly sound great and anyone would be lucky to win a pair of these great shoes. Both pairs of shoes look great, but the Cairo sandals would be my choice. I like the idea of the 3 point strap for proper adjustment, the 3D mesh insole to keep moisture away, and the active air pump for comfort. Thank you for the chance. From your review, I learned that the MBT Moja is designed for better posture and muscle toning and that the company's inspiration for their shoes came from watching the Masai people walk barefoot. 1. Joya’s Sole Technology absorbs shock, reduces stress on joints, aligns the body and spine, and increases muscle activity. I learned that they are designed to encourage better posture and aide in toning the muscles of the calf and leg as you walk and Joya needs no instruction manual as is the case with some other technical footwear brands. I'd love to win the Venezia shoes for my daily walk. I think that they're designed to encourage better posture and aide in toning the muscles of the calf and leg as you walk is wonderful. The Joya Venezia would probably be my choice based on your statement about comfort. I learned that 1)There is no breaking in period and 2)The insoles have a mesh center which both wicks away moisture and gently massages the bottom of your foot as you walk. I'd like to win the Venezia. I learned Masai Barefoot Technology was developed by Karl Mueller Sr. I also learned the Masai Barefoot Technology was created in 1996. I learned that they are CUTE and soft! Would LOVE to win some! Specialists at Authorized Joya Dealers will advise you competently. I like the Cairo womens shoes best. 1. MBTs owe their toning properties to Masai Barefoot Technology to cushion the joints, ease foot pain and increase toning. 2. Joya’s internationally patented Joya Sole Technology absorbs shock, reduces stress on joints, aligns the body and spine, and increases muscle activity. I "like" Joya Shoes on Facebook (Dara Nix)! I follow @joya_shoes on Twitter (@Kitty32504)! I would LOVE to win the Venezia's! They look SO comfy! I signed up for the Joya Shoe Newsletter! I'm following you via GFC (Cataroo)! I'm following you via Networked Blogs (Dara Nix)! I "like" you on Facebook (Dara Nix)! I Follow @GeorgiaMist on Twitter (@Kitty32504)! I learned that the soles grip well and aren't slippery and that the insole wicks away moisture and has a massaging effect on the bottoms of your feet! Sounds wonderful. From your review I learned that the sandals have Three-Point Strap Adjustments at heel, across the top and in the toe-box. They also have a sewn-in 3D mesh insole that wicks away mosture. I didn't know that MBT and Joya were created by a father and son. I think I've heard of Joya before, when I was looking into some comfortable shoes for my mom, but I'd never heard of MBT. I also read that they have an anti-microbial mid-sole, which I LOVE, because sweaty feet are the most annoying thing. And I followed Joya Shoes on Twitter. 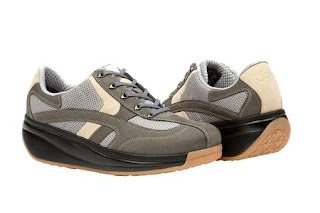 I'd really like to win the Venezia shoes--I think they're the cutest, and I need a good pair of walking shoes! I have never been able to find shoes that are really comfortable for me, so I'm excited to try these. 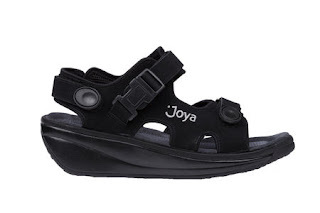 I read your review and learned that 1) Joya Sole Technology absorbs shock, reduces stress on joints, aligns the body and spine, and increases muscle activity. I also learned that 2) Joya's 3D Mesh insoles are sewn-in, which eliminates fighting slipping or scrunched up insoles. Thank you for the giveaway! The MBT technology was developed by observing the Masai people walking barefoot over natural terrain. We weren't meant to walk on cement surfaces. 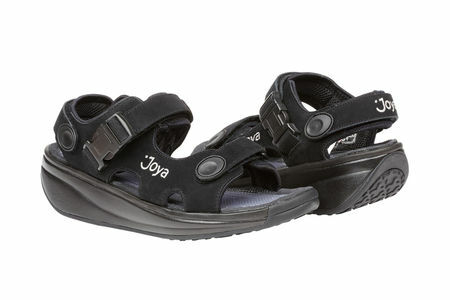 Also, the Joya shoes have sewn-in insoles with a mesh center which wicks moisture away from your feet. I would like to win a pair of Dolce Men's shoes. The MBT Moja is a rocker-based technology shoe, and anti microbial mid-sole.. I also learned Joya uses futuristic internationally patented Sole Technology that delivers a sensation while walking that has really never before been encountered. You are given the emotional experience of walking effortlessly on a concrete planet. i learned that The insoles also have a mesh center which both wicks away moisture and gently massages the bottom of your foot as you walk. these shoes sound so awesome i would really love a pair. like Joya Shoes on Facebook. Follow Once Upon a Product Review via Facebook Networked Blogs. It's cool that it has rocker-based technology to encourage better posture. And that they were designed to mimic Masai people walking barefoot on natural, uneven ground. I'd love to win a pair of the Venezias! I learned that the shoes tend to run a tab small and they probably aren't suitable for all-day wearing. I would love to get the black Cairo shoes if i won!